The Catholic Church exercised considerable influence on Irish politics and on the activity of the Irish state for a number of generations. That influence was described and criticised in a politically effective way in this magazine from the moment of its launch in the early 1970s, and most of the distinctions between Church and State in many spheres of social life which are now commonplace were first made in its pages. The extensive influence of a Church on affairs of state in Ireland was, of course, nothing new. When Canon Sheehan launched the rousing political campaign of the All-For-Ireland League against the Catholic Ascendancy element in John Redmond's Home Rule movement, he wrote: "we are told we must keep up a sectarian bitterness to the end; and that Protestant ascendancy has been broken down, only to build up Catholic ascendancy on its ruins. Are we in earnest about our country at all?" The greater part of nationalist Ireland couldn't see the point of Sheehan's question. Perhaps that is understandable in the light of the history of Ireland under British rule, in which Ecclesiastical Ascendancy had a central role throughout, being eased off only in the last generation. If Protestant Ascendancy was so right, why was Catholic Ascendancy so wrong? The English Reformation abolished the distinction between Church and state in the English state. The 1688 Revolution established a tight unity of the two. Protestant Ascendancy was established by the Bill of Rights and the Act of Toleration-the purpose of the latter being to unite all Protestants and sceptics in the persecution of Catholics. The Penal Law system in Ireland was established in the name of Liberty, and was a reign of terror based on military conquest. And the Irish Humanists told us recently that it pacified us and was good for us. Did the Penal Laws fail or succeed? They succeeded in that, in the course of a century and a half, they destroyed the easy-going, unepiscopal, undoctrinal, and therefore essentially un-Roman Catholicism of Ireland, as it remained through four centuries of English Catholic overlordship and a further century and a half of English Protestant overlordship. But the old Irish Christianity did not survive the century and a half of the Revolutionary Penal Law system in functional form. But neither did it capitulate spiritually and mentally to totalitarian power. It survived in hardened form-the final hardening being done by the Providential act of the English God, the Famine. The Irish were caricatured as hard-line Papists by the operators of the Penal Law system (even though they were part of a military alliance against the Papacy in 1690). The end effect of the Penal Laws on them was to cause them to become the Papists that they had not been at the start. They were subjected to the Protestant Ascendancy state of the "English Enlightenment" (a term applied by Conor Cruise O'Brien to the ideologues of the 1688 Revolution); they survived the worst it could do to them; and then they enacted a Catholic revolution within the form of Ascendancy state set for them by England. Protestant criticism of Catholic Ascendancy was essentially fraudulent, since it was made from a simulated secularist viewpoint adopted for the purpose of making debating points. So long as Protestant Ascendancy was sustainable it was supported by Protestant opinion, with a mere handful of individual exceptions. Protestant Ascendancy rested on bayonets. Catholic Ascendancy rested on public opinion-with metropolitan public opinion at its core. In recent years there has been a collapse of the opinion on which the status of the Catholic Church rested until the 1970s-the consequence in large part of the uncertainty which overcame the Church itself in the 1970s-and this has sometimes led to the construction of false memory by which the recent past is presented as something comprehensively different from what it actually was. The notion that Roman Catholicism was somehow imposed on Ireland has arisen as a kind of wishful thinking too tempting to be resisted. Where was the Army that might have imposed it? It wasn't imposed. It was sought out and embraced as a mode of resistance to the Protestant Ascendancy imposed by William's Army, and its logic was followed through when that resistance became a state. "How many battalions has the Pope? ", Stalin asked at one of the early United Nations Conferences, at which the new order of the world was being decided. It was a very long time indeed since the Pope had any battalions. In the 1860s a regiment of Irish Volunteers went to Italy in a hopeless attempt to defend the Papal States in central Italy against the Garibaldians. Those states went in 1870. For centuries before that the Papacy itself had no Army to speak of and there was no Great Power that would act for it (as England had once acted for it against the wayward Irish Christians). Protestant Ascendancy England was its usual ally from the 17th century onwards, and the English alliance with Rome was based strictly on self-interest. It was not by English design that Ireland became systematically Roman Catholic under English rule. It somehow happened that I got out of joint with the system of Roman Catholicism around 1950, when the Pope was Pius XII. I made my own way against the influence of that immensely influential Pope. If I had still been in Ireland when he died, I would certainly have celebrated the event. But I was living in London then and was compelled by English attitudes to the World War to be more dispassionate in the way I thought of him. The new English biography of him (Hitler's Pope by John Cornwell, a Cambridge academic) was rapturously received by "Bishop Pat" (Pat Buckley) in the News of the World (Sept. 26) under the title, Nazi Secrets Of Jew-hater Pope, and by Conor Cruise O'Brien in the Sunday Independent (Oct.17) under the title, How Pius Fawned On The Reich. And yet there is nothing new in what Cornwall alleges. A few documents not previously available are quoted, but the charge laid against Pius is not new. It is the same charge that caused me to think more dispassionately about Pius forty years ago. And, if the new documents quoted by Cornwell in support of the charge are all that he could find in the Vatican archive, what they tend to prove-if one is not so strongly predisposed against Pius that one finds him guilty beforehand-is that the charge is groundless. "when he was a powerful Vatican diplomat, assisted Hitler to power. He destroyed the viable Catholic resistance in Germany, thus contributing to the fate of the Jews". "On the world stage he was equal in stature and importance to Churchill, Roosevelt and Stalin". "Writers have generally concentrated on the fact that Pius XII was immorally silent about the extermination of six million Jews but Cornwell goes a step further and establishes that Pacelli, as prelate and Pope, actually despised the Jews". "As a young Canon lawyer Pacelli had helped to draft laws and rules that increased the Vatican's control over the worldwide Church. When he was Papal Nuncio to Germany, Pacelli imposed, sometimes by blackmail, his new type of Church terror on Germany's 23 million Catholics." "allowed the Catholic Church to impose Canon Law on all German Catholics in return for the Church withdrawing from social and political action. This paved the way for the rise of unopposed Nazism. Cornwell accuses Pacelli of being partially responsible for the First World War. Pacelli also used his secret influence to support Hitler's Enabling Act which made Hitler dictator. On the personal side Cornwell shows how in his private life Pacelli was ruled for 40 years by a cunning German nun called Sister Pasqualina who was 20 years his junior. The blonde nun was involved in many scandals and blackmailed Pacelli into silence". "If Cornwell is right, not only was he Hitler's Pope, he seems more like the Devil's Pope". The last point is fair comment on Cornwell's account: "he was the ideal Pope for Hitler's unspeakable plan. He was Hitler's pawn. 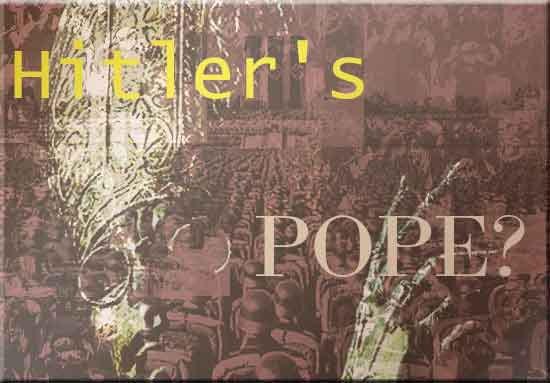 He was Hitler's Pope" (p296). I was particularly interested in seeing Cornwell's case for Pacelli's anti-Semitism. Thirty years ago I wrote a pamphlet on the origins of Zionism, explaining it as a comparatively coherent response to European developments in the course of the 19th century. But I discovered that anti-Semitism had become a very slippery concept. Ernest Bevin, a powerful opponent of anti-Semitism in British trade unionism, and one of the chief instigators of practical anti-fascism and anti-Nazism in the thirties, was denounced as an anti-Semite when he became Foreign Secretary in 1945 because he tried to prevent the establishment of a Jewish state in Arab Palestine, and because he treated Judaism as a religion and denied that it was a race or a nation. A short while before that, the view that the Jews were not a religious group but a race or nation had been the anti-Semitic position, but the meaning was reversed with the rise of Zionism. And Palestinian Arabs who objected to being displaced by Jewish colonisation were described as anti-Semites. The concept became a catch-all. Only support for the Jewish conquest of Palestine gave one a clean bill of health. That was the only way the gentile world could make atonement for its inherent anti-Semitism. But, if anti-Semitism was the general condition of Europe---and under the Versailles restructuring of 1919 it came close to being so-the Vatican was hardly the reasonable place to look to for a lead against it. Christianity may be evil nonsense, but the authoritative centre from which it was made the medium of European life had to take it in earnest. The Pope could not reasonably be expected to discard as of no consequence the detail that the Jews rejected Jesus as a false Messiah. It was the business of the Liberalism which undermined the Church to establish the comprehensive cultural alternative to it in actual life. It tried to do so. For three or four generations it was the dominant force in European civilisation, driving the Church ever farther out of public life. It was precisely in that era of Liberal political and ideological dominance that a secularised anti-Semitism provoked the establishment of a secular Zionism. The effective anti-Semitism of the late 19th and early 20th centuries was soundly based on the movement against the Church. It was a phenomenon of modern secular life. Clericalists may have latched onto it, but they were not its source. "It seemed to me that to go along with this would be to give the Jews special assistance not within the scope of practical arm's-length, purely civil or natural rights common to all human beings, but in a positive and direct way to assist them in the exercise of their Jewish cult". "So it was that Pacelli rejected a poignant plea of his Jewish brethren that might have brought spiritual consolation to many thousands" (p71). But I do not see how his reasons can be meaningfully described as anti-Semitic. Is it likely that he would have complied with a request to help out with a cult practice of Muslims or Plymouth Brethren? "A gang of young women, of dubious appearance, Jews like all the rest of them, hanging around in all the offices with lecherous demeanour and suggestive smiles. The boss of this female rabble was Levien's mistress, a young Russian woman, a Jew and a divorcée, who was in charge. And it was to her that the nunciature was obliged to pay homage in order to proceed. This Levien is a young man, of about thirty or thirty-five, also Russian and a Jew. Pale, dirty, with drugged eyes, hoarse voice, vulgar, repulsive, with a face that is both intelligent and sly". "Pacellis's constant harping on the Jewishness of this party of power usurpers is consistent with the growing and widespread belief among Germans that Jews were the instigators of the Bolshevik revolution, their principal aim being the destruction of Christian civilization. The repeated references to the Jewishness of these individuals, amid the catalogue of epithets describing their physical and moral repulsiveness, gives an impression of stereotypical anti-Semitic contempt" (p75). But, if Pacelli saw Jews through anti-Semitic stereotypes, why did he not describe the Munich Rabbi as sly, oily, insidious etc.? It is a very long time since I read about the Munich Soviet, but I know that it was not an impressive affair. It is not unfairly described as a revolt of the rabble. It lacked the purposeful directing centre that caused the Russian Soviets to make such a stir in the world. It fell after a few months. Its only enduring contribution to the world was a survivor of it who wrote social novels on Latin American themes under a pseudonym which I forget and whose real name was never discovered. And Jews were disproportionately prominent in it, as they were in Bolshevik movements everywhere. Because of their mode of existence, they were the people in Europe to which the Bolshevik vision made the most immediate sense. Churchill, a senior Cabinet member in the most powerful state in the world, saw the Jewish problem as a very serious problem for European civilisation and wrote about it frankly in the English press in 1920. (For example, Zionism Versus Bolshevism, A Struggle For The Soul Of The Jewish People, Sunday Herald, 8.2.1920.) He need not have been an anti-Semite to do that, but there is no doubt that he was an anti-Semite. He had no doubt about the right answer to the question: Would you let your daughter marry one of them? And Balfour's justification of the Balfour Declaration of 1917---from which the Jewish state in Palestine derives-if not anti-Semitic in the personal Churchillian sense, is at least based on the assumption that there was a genuine problem for Europe in the Jewish mode of existence and that it would be a good thing to shift it elsewhere. Pacelli and everybody else in Europe after 1918 had to function in an arrangement of things decided upon by Britain, and of which Britain was the self-appointed arbiter. There was formally a kind of Anglo-French overlordship, but Britain vetoed the French proposal for a post-war settlement (which would not have allowed for an upsurge of resentful German nationalism) and therefore the responsibility of careful supervision was very particularly Britain's. The German Republic (the Weimar Republic) submitted to an Anglo-French demand to sign a confession of "war-guilt" on behalf of the German people for starting the Great War, backed up by a threat of immediate resumption of the war if it refused. And the territory of the German state was reduced by the transfer of Alsace-Lorraine to France and Upper Silesia to Poland. Having done so much, France wanted to safeguard the situation by doing more. It was to be expected that, as Germany got going again, a politics of national revenge would come to the fore. In order to make revanchism ineffective, France wanted to split up the German state into two or three and to extend the borders of France up to the Rhine. This would have been in accordance with Britain's wartime propaganda, which claimed that the combination of Prussia with the Rhineland and Bavaria was the major source of evil in the world. But implementation of the French policy would have made France the dominant state in Europe, and it was vetoed on balance-of-power grounds by Britain. And it was the resulting state of affairs, combining German national humiliation with a potentiality for a resurgence of German strength, that made Nazism possible. Pacelli treated Germany's difficulties as the Vatican's opportunity. In 1922 the Bishopric of Trier was vacant. Weimar wanted it filled quickly in order to strengthen its position against France. Pacelli bargained for an improved Church position on schools. Cornwell describes this as drawing "an equivalence between the schools question and menacing territorial issues (p97), and approvingly summarises a German view that "it would only tend to encourage the French to greater acts of territorial aggression" (p98). This is the language of the British anti-French propaganda of the time. Cornwell's reasoning is based on hindsight. We know that Nazism came to power and we know about the wartime extermination camps, and we are asked to judge events of the twenties and early thirties in the light of the events of 1933-45. But he does not even attempt to do that with a credible show of realism. He writes as a mere apologist of British policy. French policy, which was practicable, would have stopped Nazism at source by depriving it of its arena. ...would assist Germany in a bitter territory dispute with Poland. Poland had laid claim to upper Silesia. Pacelli dragged his feet, possibly because he disapproved of [Catholic Chancellor Joseph] Wirth's leftist tendencies" (p97). Of course, it might also be that the Vatican did not see how an alignment with German nationalism against Poland would be to its advantage, Poland after all being a Catholic state and Upper Silesia being part of it by Anglo-French decree. Cornwell represents Pacelli and Hitler as having been made for each other. (It puts one in mind of the flower and the bee in Goethe's poem, Gleich Und Gleich) But why "Hitler's Pope", rather than Hitler: Pacelli's Chancellor? "the principal condition imposed by Hitler in 1933 was to be nothing less than voluntary withdrawal of German Catholics from social and political action as Catholics, including the voluntary disbanding of the Centre Party, by then the sole surviving viable democratic party in Germany. This abdication from political Catholicism was to be implemented by Pacelli himself" (p85). And this opened the way to Nazi dictatorship! Cornwell makes his case against Pacelli in abstraction from the course of actual political life in Weimar Germany, with the result that he pretty well reverses cause and effect. Weimar began in the conditions of humiliation deliberately inflicted on Germany by Britain and France, and ended in party-political chaos. Hitler's dictatorship was accomplished within constitutional forms and rapidly acquired extensive popular support. The parties which had made such a mess of political life for fourteen years crumbled almost at a touch, as if their members were glad of an excuse to leave them. If anybody was under clear obligation to over-rule the Enabling Act, and had both the power and the authority to do so, it was Britain. But Britain, playing Germany against its co-author of the Versailles system, France, chose to let this internal development run its course, and it facilitated Hitler until 1939. Cornwell's implied view is that, in the Summer of 1933, the Centre Party---"political Catholicism"---should have set up as a centre of resistance to the political development that was taking place through Constitutional forms in the Reichstag. This would in practice have meant establishing itself as a rival centre of state. The Centre Party was different in kind from the others, in that it was the Catholic Church in politics. It had therefore a base outside the dissolving party-politics of Weimar, i.e., the twenty million Catholics. But, instead of pitting the Catholic Church-in-politics against the Nazi development of the Weimar state, the Vatican urged the dissolution of the Centre Party in exchange for a Concordat. But neither the German Catholics nor the Centre Party had lived apart from the course of Weimar politics, 1919-1933. They were thoroughly implicated in Weimar affairs from the first humiliation to the final chaos. They had been drawn into state politics after 1918 as never before, and the desire for escape from the futility of it all was felt by Catholics and by Catholic Party members as well as by others. The Catholics may have been Catholics above all else at the time of Bismarck's Penal Laws (the Kulturkampf), but through their participation in government in the Weimar period (when the Centre Party supplied about half a dozen Chancellors), they had become Germans politically. Konrad Adenauer is missing from Cornwell's account of German affairs. He is mentioned twice in passing, with the suggestion that his position was in tune with Brüning's. They were members of the same party. Adenauer was already a major political figure when Brüning became politically active, even though the main part of his political career lay post-1945. He was not a German nationalist, as Brüning was and as the Social Democrats were. In 1919-21 he was understanding of the French position and was amenable to the establishment of a semi-detached Rhineland structure. His position never got clarified because Britain vetoed the project, but it is clear that he understood the great danger in humiliating Germany without disabling its capacity for revenge. He refused to become Weimar Chancellor a number of times and, until he was removed from Office in 1933, he governed the Cologne region, in a manner that was very different from Brüning's government of the Reich. The Christian Democratic Union, which he launched in 1945, was very much not the Centre Party, and Adenauer was not welcoming of Brüning when he returned from exile to Cologne in the 1950s. Adenauer is not a political figure who might simply be overlooked in an account of German politics in the 20s and 30s, whether or not written in the light of hindsight. I take it that his omission from Cornwell's account means that he does not fit Cornwell's argument. And I do not recall from fairly extensive reading about the period that he was hostile to Vatican conduct of Church affairs, as Brüning was, on the grounds of the interests of "political catholicism", i.e., the Church as a political party operating in a German national context. Cornwell's reasoning about Hitler's Pope is weak, strained and overblown because the book is really about something else. It would have been more honestly presented as a condemnation of Catholic developments after 1848. What Pacelli is condemned for is contributing before his election to a development set in motion long before he came on the scene, and implementing a well established Vatican policy. Hitler and Pacelli were made for each other in the matter of the Centre Party because the Vatican did not favour Catholic parties. The policy was to secure the position of the Church through Concordats. "Pacelli was responsible for a Treaty with Serbia which contributed to the tensions that led to the 1st World War. Twenty years later he struck an accord with Hitler which helped sweep the Fuhrer to legal dictatorship" (p4). The Treaty with Serbia was a Concordat regarding the small Catholic minority in Serbia. Prior to the signing of this Concordat in July 1914, the Catholics in Serbia were a kind of Protectorate of the Austrian Empire-the Holy Roman Empire. Cornwell says that Austrian outrage over this breach of faith by the Vatican was a contributing cause to the strong Austrian ultimatum to Serbia over the Serbian assassination of the Archduke at Sarajevo a week later, and thus to the World War. It may or may not have been a factor in the European War. It was British intervention for expansionist purposes after that War had started that brought about the World War. The "most important event in the history of the Catholic church in the modern era" was the completion in 1917 of the Code of Canon Law set in motion seventy years earlier by Pius IX. This superseded the old Canon Law, which was "rich in local diversity". The chief aim of the Vatican then became the extension of the new Canon Law to all branches of the Church by means of Concordats with the various states. "The code was to be applied universally without local discretion or favour" (p4). "Rome had declared unilateral independence from all secular influence" (p43). In fact, the declaration of independence came after Rome had been set adrift. Following the steady erosion of temporal power in the 18th and early 19th centuries, there was a dramatic subversion of it in 1848, a conquest of it in the 1860s, and a final loss of it in 1870. The Liberal Humanist script said that, with the loss of temporal power-coercive power-the Roman Church would wither. If Liberal Humanism had been able to live up to its pretensions, that might have happened. But Liberal Humanism wasn't, and it didn't. Bishop Pat's comparison of the Pope with Stalin, Churchill and Roosevelt as powers in the world is groundless, but the fact that it could be made at all indicates the depth of the failure of Liberal Humanism to establish a post-Christian medium for actual life. I have seen it argued that the First Vatican Council was the prototype for 20th century totalitarian movements. Cornwall does not say that, but his book would be more coherent if he did. It is not easy to infer a viewpoint which harmonises the welter of criticisms which he flings around. Mutually exclusive standpoints occur to one in the course of reading the book: a) that the Church should not exist at all as an organised body; b) that it has a responsibility of universal supervision. The unrealistic special pleading of the first part of the book is intensified when it comes to arguing that the Pope was responsible for the Holocaust. The minuscule temporal sovereignty restored to the Vatican by the Treaty with Mussolini enabled it to shelter some thousands of Italian Jews. Cornwell holds the Pope guilty because he did not become involved in an internal dispute between factions of the Nazi authorities in Italy, and because he did not issue a general condemnation of Nazism and of extermination camps. The first charge is bizarre. And the second course of action would probably have brought the little Vatican state to an end. The extermination camps were set up in the hinterland of the War in the East late in 1941. It is a virtual certainty that nothing like them would have been attempted, but for the War in the East. The general condition of War was brought about by Britain, for reasons that had nothing to do with Hitler's Jewish policy. The idea of an objective and inescapable "anti-Semitism of fact" figured in British publications on the Jewish question during the war. The "Jewish problem" was not dismissed as a delusion. Britain, the major world power, launched the War without having the will to fight it. It did not intervene in the German/Polish War, which was the excuse for launching the World War. It had to be a World War because Britain, the major world Power, was only willing to fight Germany through the agency of third parties. When France failed to win the war for it, it refused a settlement, hoping that a German/Soviet War could be conjured out of the unsettled condition of Europe. It was. And it was in the obscure hinterland of that gigantic war that the extermination camps were constructed. The British Government was provided with evidence of them by the Polish resistance, but refused to do anything about them-by bombing them, by making them a war issue, or even by bombarding the population of Germany with information about them. Britain's last effort as the dominant world Power-which was at once reckless and cautious-brought about the state of affairs where the defeat of Hitler depended on the victory of Stalin. And Pacelli had an "obsession" about Communism. When he was Nuncio in Bavaria, his limousine was seized by the Munich Soviet, and "the incident has often been cited to explain his great hatred of communism" (p76). So the defeat of Hitler did not appear to him as a simple cause for rejoicing. It is a curious position that sees the need to explain the profound hostility of a Pope to atheistic Communism by reference to a personal humiliation! Rome, deprived of temporal power by European Liberalism, organised the Church as a distinct body. In the twentieth century it tacked between elemental socio-political movements which it had no responsibility for bringing into play, and it acted with a view to preserving itself. The catastrophic events of the century were the doings of the Temporal Powers which had excluded the Papacy from their ranks. The history of the 20th century has become impossibly problematic for Britain, which launched both of the World Wars through which it happened. The conquest of Poland in 1944 by the Red Army was presented as the liberation of Poland for which Britain had declared war in 1939, but very few Poles saw it like that. During the 45 years of the Cold War, the sheer power of the Soviet state kept opinion divided. There was a substantial body of opinion that did not agree with the slogan, Better Dead Than Red, but it was the guiding maxim of NATO, and is the perspective in which Pius's "obsession with Communism" should be seen. Since the collapse of the Soviet state, it has become the universally held opinion of British public life that the Soviet system was from start to finish nothing but a criminal enterprise and that Stalin was the most monstrous tyrant of the century, if not of all time. The wartime view of the War is therefore no longer sustainable, and post-1990 hindsight does not present even the illusion of clarity. In this context of utter confusion, Cornwell seeks for a scapegoat for some of the things for which Britain itself bears the central responsibility. Perhaps it is understandable that globalist Ireland, which has become incoherently dissatisfied with what it made of itself in its struggles against the British Protestant Ascendancy, should feel inclined to go along with the scape-goating of a Pope towards whom it was profoundly respectful in his lifetime. It is not a feeling that arises from strength and self-confidence.